"Comprised of 5 barrels of Silver Eagle clone 828, 7 barrels of Lancel Creek Vineyard clone 777, 9 barrels of Riddle Ranch clones 828 and Pommard and all 3 barrels of Willow Creek, this offering is quite a bit different from the 2009. It’s definitely from a riper part of town but possesses a similar acid/tannin profile. The character here is more pure red fruited with notes of cranberry, red raspberry, spearmint, underbrush and sour cherry. The wine starts out pretty primary and throws off some of its weight as it opens. Given the price point, it’s a nice entry wine for the program but still an offering we take no less seriously than all the single vineyard designates. 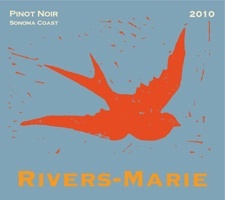 We feel this edition will drink very well early on and offer you an insight into why we love Occidental in 2010 so much." On the nose I get generous aromas of ripe red raspberry, wild strawberry, strawberry rhubarb pie, cranberry, orange rind, graham cracker, and just hints of soil. It's a very pretty bouquet and one that perfectly typifies perfectly ripened Sonoma Coast Pinot Noir. After three days of having the bottle open the aromatics have dramatically improved and developed. This leads me to believe that the wine will improve with a year or two of additional bottle age. On the palate the wine expresses a medley of red fruit flavors such as raspberry jam, wild strawberry, and ripe black cherry. There's also a slight toastiness that accompanies the fruit and adds a layer of complexity. The texture is soft and silky and the wine finishes with a really nice baked raspberry pie and toasted graham cracker notes.